Provide you a free quote & have upfront & fixed prices with no hidden costs. We give you a guarantee of all the work done. Get an accurate quote from your problem today! Waterwize services are specialists in the Hot Water System Industry. For the last 25 years, we at Waterwize services have been delivering quality services to our customers with anything to do with hot water system repairs, sales and installation. We have an able team of qualified and licensed plumbers, electricians and gasfitters who are dedicated to providing services that are second to none. Our professional and trained team is available 24 hours a day and all days of the week to provide you professional hot water services. We have skilled servicemen who are available whenever you need to install a hot water system, repair a leak, and solve your drainage problems- we give you the best man to get the job done. Cistern and toilet repairs for leaks and malfunctioning. We provide you a free quote and have upfront and fixed prices with no hidden costs. With years of experience, knowledge and professionalism Waterwize services has become a trusted name in the Australian Hot water market. We have the support of key manufacturers of Gas, Electric, solar and heat hot water systems. 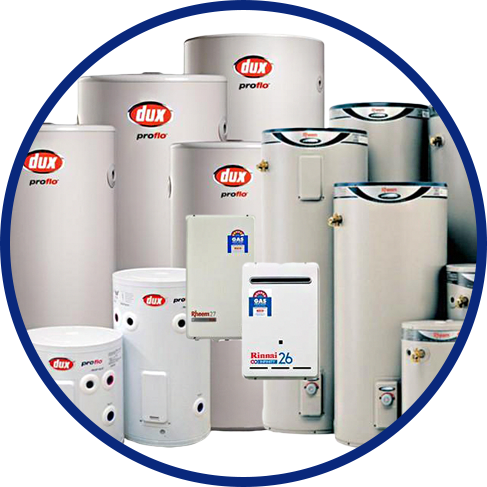 We specialize in major brands like Rheem Hot Water Systems, Rinnai Hot Water Systems, Dux Hot Water Systems, Aqua Max Hot Water Systems and Vulcan Hot Water Systems to name a few. So if you are looking to buy a solar hot water system, gas water heating system or Heat pump hot water system, then we have all the different brands under one roof. We understand your need to conserve energy and are always ready to provide you advice and help regarding the right hot water system suitable for your family. Apart from installation, we also provide you with services, repairs and replacement whenever required.